The Blackhawks finished last in the Western Division and missed the playoffs. By then, it was obvious that the Tri-Cities area was too small to support an NBA team. 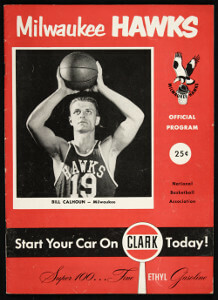 After the season, the franchise relocated to Milwaukee, Wisconsin, and became the Milwaukee Hawks. Upon moving from Tri-Cities to Milwaukee the tam shortens its nickname from Blackhawks to Hawks. 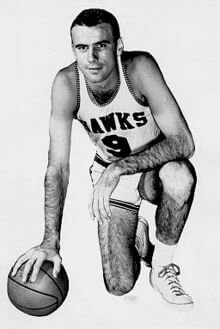 Playing in the larger Milwaukee Arena better known as The Mecca the Hawks played lackluster basket ball, posting a horrid league worse 17-49 record, with Mel Hutchins, who tied for second in rebounding with 13.3 boards per game the team's lone highlight. Hawks - The Tri-City Blackhawk’s name was shorted to just Hawks after the team moved to Milwaukee. Who is the greatest Milwaukee Hawks? Upon moving from Tri-Cities to Milwaukee the tam shortens its nickname from Blackhawks to Hawks.